"Mr. Adair was born in South Carolina in the year 1783; just at the close of the American Revolution. He descended from one of the old families of the Adairs of Scotland where all the Adairs in Europe and America originally sprang from, according to tradition handed down from generation to generation. His great grandfather, Robin Adair, was the boon companion of Robert Burns, the Scottish bard. It was said of him: "He was a decided character, a good peacemaker, of jovial good humor, witty and wise. At all public places he would have a crowd around him listening to his witticisms and songs." Some of his descendants emigrated to Ireland, some to England. His son, Robert, went to England, and his son, Robert married Sir John Sidney's daughter, emigrated to America and settled in Virginia. Before leaving England he named one of his sons after both grandfathers, Robert Sidney. This son married a widow, Elizabeth Huffman, nee Posey, who had two children, Adam and Sally. This marriage took place in 1774, and these were the parents of the subject of this sketch. At the beginning of the war with the mother country, he enlisted in the war for independence and served four years in Virginia, his adopted state. In common with the Whigs of that day, he suffered from the depredations of the Tories. During one of their forays in his absence they captured all his negroes, eighteen in number, his wagons and horses, sacked his house, destroyed his beds and bedding and all the family's subsistence, leaving them destitute of even the necessities of life. On being informed of his family's destitute conditions, he obtained a furlough and a transfer to the army of South Carolina. Upon his return home he found that the worst had not been told. All his property was gone and his family penniless. He at once refugeed to South Carolina, where some of his wife's relatives, the Posey's, the Stringers and other old Virginia neighbors, lived. As soon as he could procure a temporary home for his family he reported for duty to General Marion's command. The same troubles awaited them there. The Tories were more numerous and lawless there than in Virginia and to these he gave special attention and many a heartless devil bit the dust. News of the surrender of Cornwallis reached them and he and others started for their homes. Upon nearing his home, he was fired upon by a squad of Tories and killed. This was three weeks before the birth of our present subject who was well called Robert Sidney in honor of his father. Mr. Adair's wife, Patsy Lefevre, was related to the distinguished Lefevre family, originally from France, late of South Carolina. Her mother was a widow named Milliner Letcher, whose maiden name was Key. Her father was of the large connection of the Key family, of Virginia, some of whom moved from there to South Carolina and some to Georgia. In November, 1818, Mr. Adair moved to this county (Gwinnett) and settled on a farm on Yellow River about four miles north of Lawrenceville. Samuel Maloney, who had married his sister, Nancy, in South Carolina, moved here with him and settled on the other side of the river on what has since been known as the McDill place. They arrived on the first of December and built them a tent as a temporary residence. This was just before the fifth land district of this county was surveyed. Here he lived four years and then bought a tract of land one and a half miles north of Lawrenceville and moved to it in the fall of 1822. In a few years he had opened a good farm, built a good house and here he lived in peace, quiet and contented, for many years, and here he died. He was an indulgent parent, but firm in his family government, teaching his children obedience and good morals. In politics he was an old line Whig, always voting for his political friends. He held the office of Justice of the Peace in the town district for a term and the position of Justice for the Inferior Court for four years. When the lands of the Cherokees were to be drawn for, he was appointed to take the names of those in this county entitled to a chance in the lottery. In 1834 he connected himself with the Baptist Church at New Hope, not far from his residence. His wife was also a member of the same church. He was appointed a delegate from his church to represent it at an association to be held in Walton County. Here he made the acquaintance of the distinguished Jesse Mercer, who was the leading Baptist minister of Georgia in this day. He was much pleased with Mr. Mercer and his preaching. From him Mr. Adair purchased a hymn book, the old Mercer's Cluster, now out of print except an old copy occasionally found in Baptist families and treasured as an heirloom, a relic of a bygone age. At this meeting of the association he subscribed for The Christian Index, then edited by Mr. Mercer, and the organ of the Baptist denomination in Georgia. The Index then, as now, was an exponent of foreign missions, and from time to time published missionary information from Burma, Calcutta and other places, and especially Mr. Judson's letters. Elijah Moore was the pastor at New Hope and would often call on Judge Adair, then the church clerk. On his visits, the preacher would criticise The Index, find fault with it's missionary articles, and ridicule Mr. Adair, his friend and brother, for being so weak-minded as to take such a paper, or to indorse it's teachings, and for doing so ought to be dealt with by the church. At the next conference, Mr. Adair, the clerk, stated that he had discovered that there was a difference of opinion among the members and that the pastor, Brother Moore, differed radically from them as to the question of missions, as well as on other questions of church policy, and before the storm came, Mr. Adair said: "I move that you authorize your clerk to make out a letter of dismission to each member so that they may be free to connect themselves with any church they please." The motion was put and carried and New Hope from that day ceased to live and has never been reorganized. The immediate family of Judge Adair consisted of two daughters and four sons. Elizabeth married Moses A. Brandon in 1837 and died of consumption in Cass County in 1847. Patsy married Joseph A. Young in 1843 and died in Cass County in 1846. Madison Lefevre, the oldest son, lives in Lawrenceville, and was for two or more terms the efficient clerk of the Superior Court of this county, and married the daughter of Berryman Camp of Jackson County. 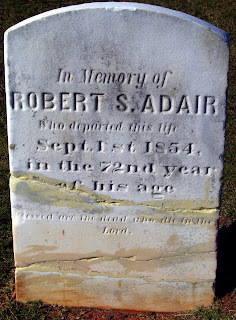 Robert Sidney Adair now lives in Thomasville, Georgia, and married, first, a daughter of James Hood, and then a Miss Price. Terry Jackson Adair died in 1868, and William M. Adair was killed at Gettysburg in the army of Northern Virigina on July 4, 1863. Up to 1853 the health of Judge Adair was remarkably good for one of his age. 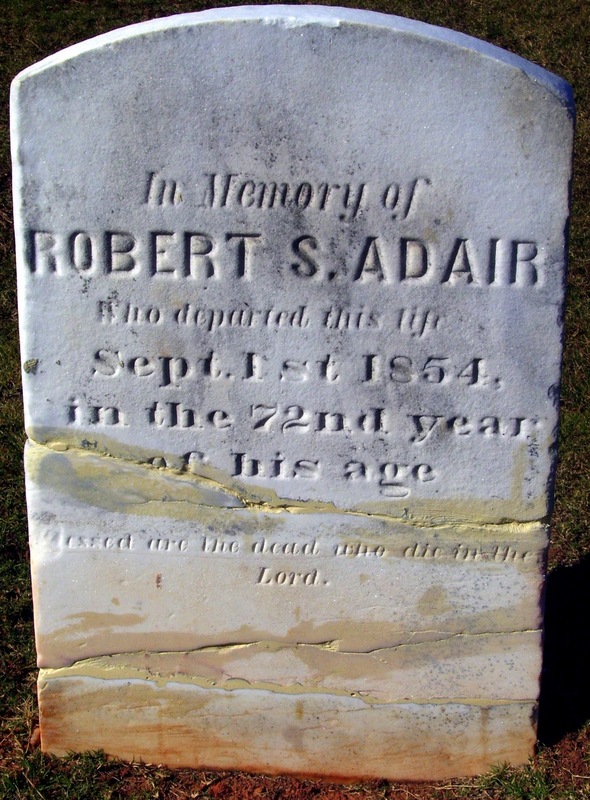 His health then began to decline and on September 1, 1854, he died of dropsy and was buried at Fairview Presbyterian Church in Lawrenceville, Georgia. His widow survived until July 23, 1869, and died at the old homestead. Many other incidents of this family have been furnished me running back to their far off ancestry, which would be interesting to the reader, but for want of space they must be left out of this article. From a long personal aquaintance with Robert S. Adair, I bear testimony of his moral worth, his uprightness as a Christian, his integrity as a citizen, and to his honesty as a man. In all these commendable traits, he had his equals perhaps, but in these he was not excelled." What a story! Fascinating - so many trials and tribulations.